How my grubby hands got a hold of this book: Forked over the cash at Borders for it! Why I read this book: Readers that I respect were raving about it! This book is the literary equivalent to the reality show Survivor for me--with the exception that children are actually killing each other to survive and are there against their own will. Forget about that fact and throw in hunky Jeff Probst and I'm feeling like I don't have to wait until the next season of Survivor. Disclaimer--I'm a Survivor junky. It isn't quite that easy to forget about the basic premise of this dystopian young adult novel. It is set in the future when North America, a nation in ruins, is replaced by the nation of Panem. Life in Panem is vastly different from life as it was previously on this continent. The Capitol is the ruling regime over 12 "Districts" and they rule with a strict iron fist and rebellion is not an option. To show their strength, they have set up the yearly Hunger Games in which a boy and a girl from each district must go to a remote location controlled by the Capitol and kill each other as *cue Jeff Probst voice* there can only be ONE sole survivor. Enter our heroine--Katniss Everdeen. She comes from one of the poorest districts and knows a little bit about surviving. Poster child for the School of Hard Knocks. She, in a way I'll not disclose, gets put into The Hunger Games that she so despises and finds that her big heart and her street smarts conflict with her need to survive this disgusting "game" that is broadcasted throughout all districts. She is an altogether likeable heroine (despite on occasion some bad judgments & naivety ) and could easily outwit, outlast, and outplay ANY former Survivor contestants to date. I found this one of the best YA books I've ever read. It's certainly different although some people thought it was cliched and predictable. I guess I haven't been reading any of the same books as them to feel that way. I felt it was well written and kept my interest so much that I read it all in one day. I feel like, for me, it was pretty thought provoking as I thought about the situation and how hard it would be to make the decisions that she had to make. How do you maintain who you are after something like that? How do you justify your own survival versus the lives of others? I thought that the author did a great job with the little character development she was able to do. You get a sense of all the main characters but it's quite hard when most of the characters in the book are dropping off like flies. It the same way I feel with Survivor. You never get a sense of the characters that get ousted out in the first couple tribal councils and you forget who they are almost. In the book, you really start to get to know some of the other contestants that last a little longer and it makes it harder when they die. Jamie- I'm so glad you liked this book! I love your review and the comparison to Survivor. You must pick up Catching Fire soon! Ooh - I have this one sitting on my TBR shelf. I've been trying to wait until later in the summer, closer to when the third book comes out, to read the series, but I keep hearing so many good things about it that I may have to read it sooner rather than later! Thanks for the review! Great review. I've heard a lot of good things about this book. Thanks ~ looking forward to reading more of your reviews! One of my few 5 star books. I wouldn't start Catching Fire until you have enough time to spend reading it. I mean consecutive time too. Like a read a thon or something. I agree with Julia...definitely read Catching Fire, but give yourself a few hours to finish it! You won't be able to put it down! Great review! 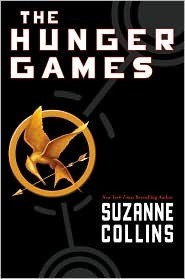 I've read both the Hunger Games and Catching Fire in one go and I agree it's probably the best way to fully enjoy them. Plus I couldn't bring myself to do anything but keep reading. I'm so excited about Mockingjay coming out August 24! So glad you enjoyed The Hunger Games! It's easy to become obsessed with them, I know that I am. I'm so glad you loved this one! It's easily one of the best YA books I've read too. I agree with the previous comments too; make sure you have the time to sit and read Catching Fire, it's hard to put down. I can't wait for Mockingjay to be out in August!